Who doesn’t like a holiday that embraces fried food, and whose signature dishes are potato pancakes and jelly donuts? 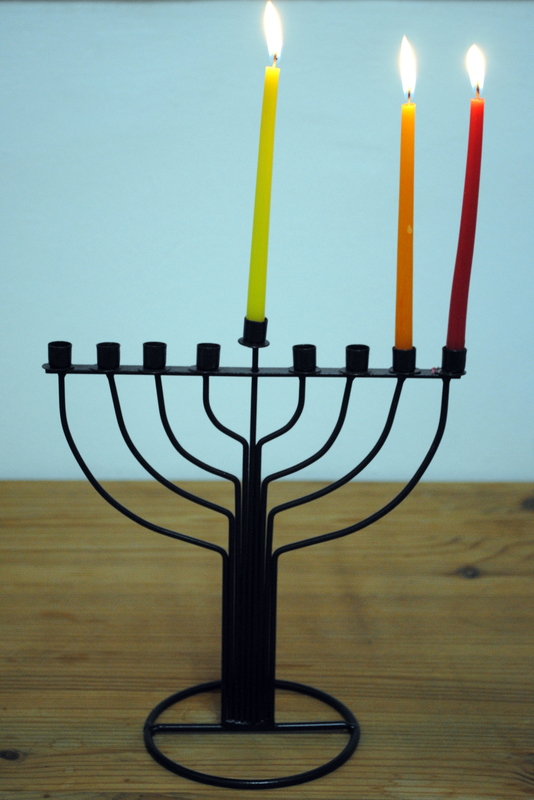 For Hanukkah, the Jewish holiday that celebrates oil, anything fried and greasy goes. Don’t even think about trying some low fat baked option. It goes against the whole spirit of the holiday. Normally we rely on my mother-in-law’s potato latkes and a family holiday party to get our Hanukkah fill. 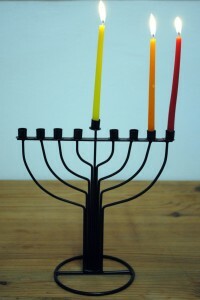 And even though we’re in Israel, Hanukkah really isn’t such a big deal here. Seriously, there are more mitzvah mobiles and cabs topped with menorahs in New York. The one palpable difference is that on the first night I stuck my head out the window and could literally smell the frying oil in the air, and I knew that inside everyone was celebrating in their own way. Also, suddenly sufganiyot (jelly donuts) are available everywhere, and I mean everywhere. I knew I needed to have my own fried food celebration. But what to make? After scouring the internet and Jewish cookbooks new and old I discovered that there really are few foods that are traditionally served at the Hanukkah table. Beyond latkes and sufganiyot there is no script. Then there was the question of what kind of latkes to make. For a brief moment, the modernist avid food magazine reader in me wanted to experiment with fancy combinations like beet and celery root and toppings like shredded short rib. But then I realized I had to keep it simple. 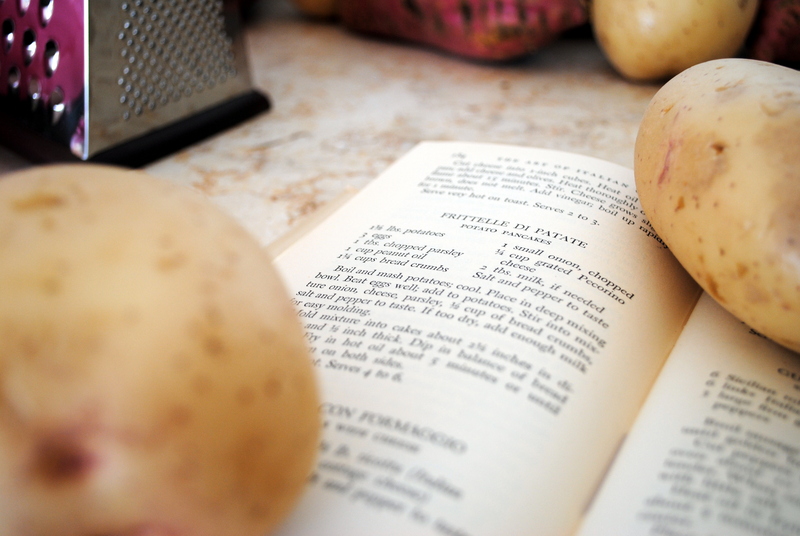 And so I selected three potato pancake recipes that each have a story to tell, and are indicative of where we are at this moment. My mother-in-law’s latkes represent tradition, comfort, and Evan’s background. Crispy on the outside, creamy on the inside they are also my standard for what a latke should look, feel, and taste like. These latkes are the classics made with shredded potatoes, onions, egg, and flour. That’s it. The Fritelle di Patate from Maria Lo Pinto’s The Art of Italian Cooking signify my Italian heritage in more ways than one. This 1950 cookbook was my Hungarian grandmother’s bible; now out of print it was given to me as a wedding present. 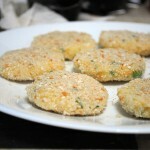 Rather than shredding the potatoes this recipe calls for mashing them with onions, parsley, breadcrumbs, and Pecorino then forming them into patties and frying them. They share a flavor profile with traditional latkes but come in a completely different form. 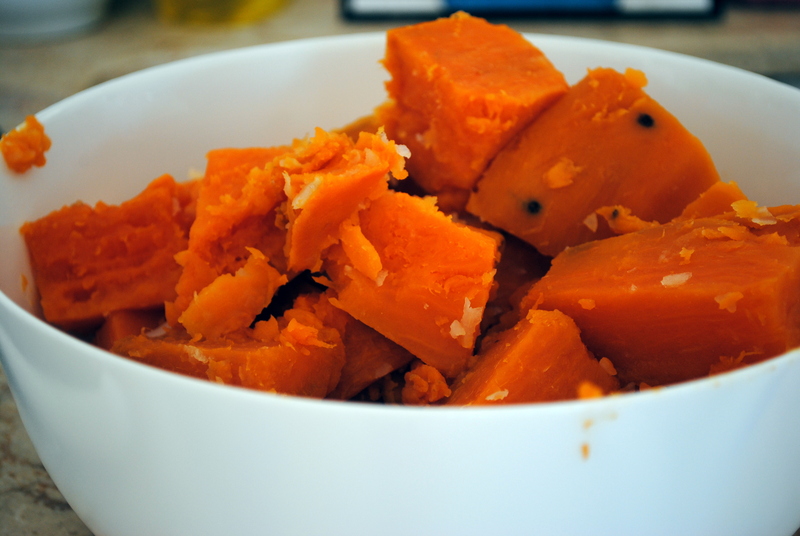 This recipe would be a great use for leftover mashed potatoes. 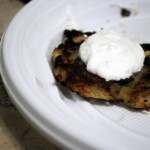 Finally, I had to include one modern rendition of potato pancakes. 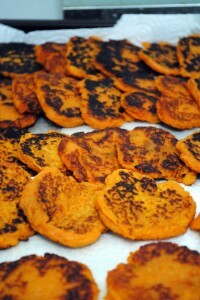 The signature dish at popular Tel Aviv Restaurant Orna and Ella is sweet potato pancakes and I have been dying to try them. For the time being I decided to make them. These dense, chewy pancakes combine mashed sweet potatoes with soy sauce for a savory-sweet, heavenly combo. And they represent where we are now, both in terms of time and place. And I like to think that these three potato pancakes served at the same Hanukkah table are a little nod to the mash-up of cultures that is Israeli cuisine. It celebrates the traditions of our homeland and that of our ancestors at the same time that it embraces the here and now. To round out this culturally mixed up jumble of a meal I also served olives, hummus and pita, fried schnitzel fingers, couscous salad with dates and almonds, fennel salad with orange and pomegranate, and, of course sufganiyot. My friend Beth shared her spectacular Rainbow Cookie Cupcakes. 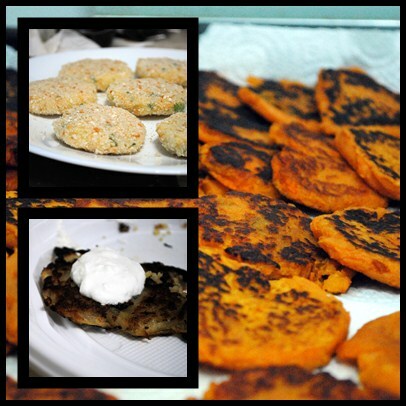 And there was plenty of sour cream, apple sauce, and even smoked salmon to top the latkes. A note on execution: the inherent problem with a fried food celebration is that fried food is really at it’s best fresh out of the fryer. 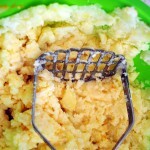 Traditional potato latkes must be served immediately and the mix cannot be made even a little bit ahead since the shredded potatoes will quickly turn an unappealing brown and then gray. The Fritelle di Patate and Sweet Potato Pancakes made life easier because both mixtures can be made a few hours ahead; additionally the pancakes can be made and don’t suffer too terribly from being reheated in the oven just before serving. 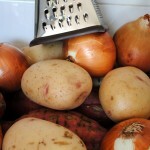 Using your hands, squeeze out extra liquid from the shredded potatoes. 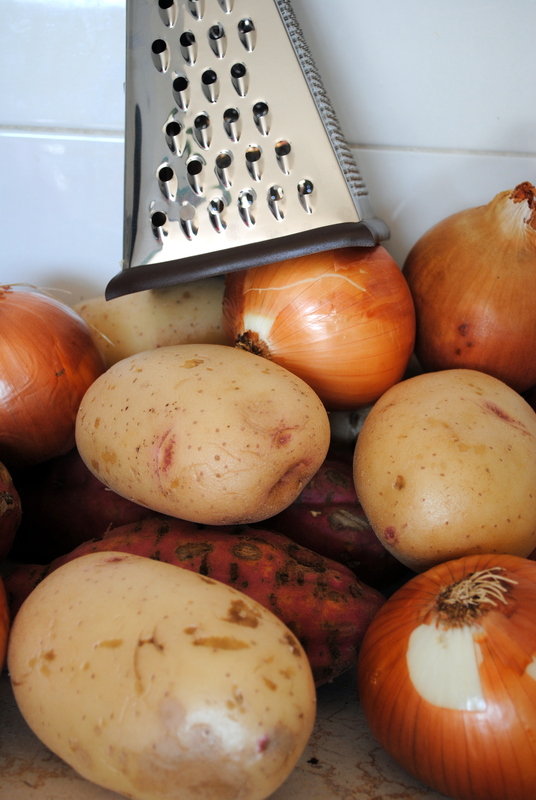 Add the onion, eggs and matzoh meal or flour; mix to combine and season with salt and pepper. Heat vegetable oil in a skillet over medium-high heat until very hot. Put one large tablespoon of the mixture into the pan and press down with the back of a spatula or measuring cup so it is an even thickness. Do not crowd the pan. Flip when the edges look brown and crisp. When the other side is done transfer to a paper-towel lined plate and serve immediately or keep warm in a 200F oven. Boil and mash potatoes; drain and let cool. Transfer to a deep mixing bowl. Beat eggs well; add to potatoes. 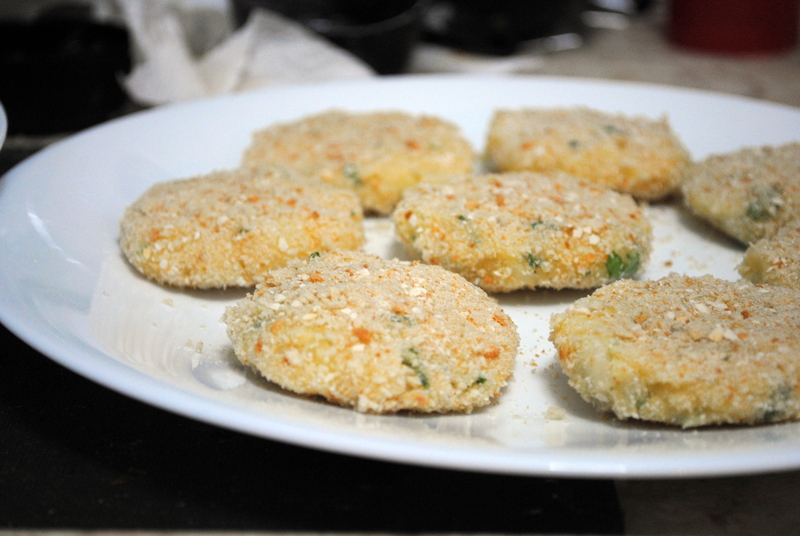 Add the onion, cheese, parsley, ½ cup of the bread crumbs and the milk into the mixture. Season with salt and pepper. Mold mixture into cakes approximately 2½ inches in diameter and ½-inch thick. Dip in balance of bread crumbs. Fry in hot oil until golden brown on both sides, flipping once. Transfer to paper towel-lined plate. Serve immediately or reheat in oven. 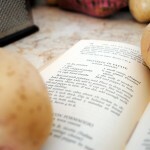 Cook the potatoes in a large pot of boiling water until soft. Drain and let cool. Transfer to a large bowl. Add the soy sauce and mix gently with your hands (the mixture will be sticky). Add salt, sugar and flour and mix again, until thoroughly combined. 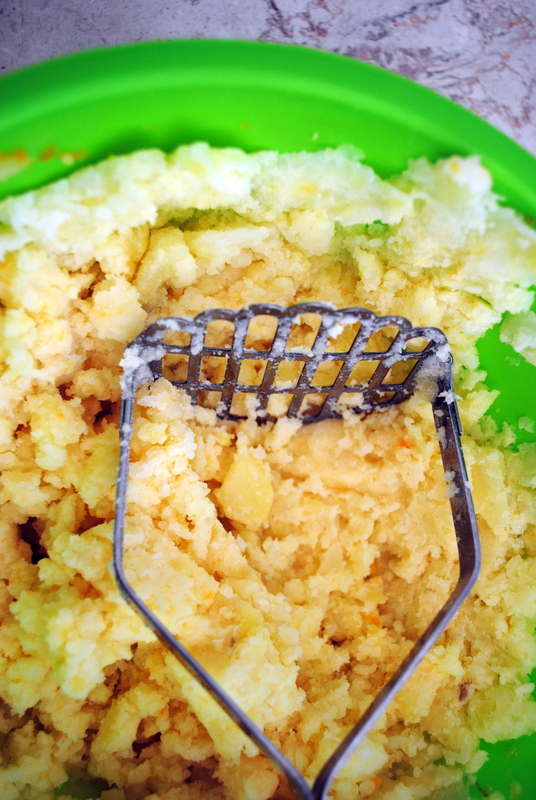 Discard any hard bits,and avoid over-mixing, which will make the batter heavier and even stickier. 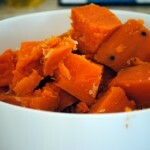 Set aside for half an hour at room temperature. Heat oil in a skillet over medium-high heat until hot. With wet hands form small balls of the batter; drop into the hot skillet and flatten with the back of a spatula (I sprayed the spatula with PAM to prevent sticking). Alternately, you can use a piping bag, fit it with a smooth wide nozzle, as they do at Orna and Ella. 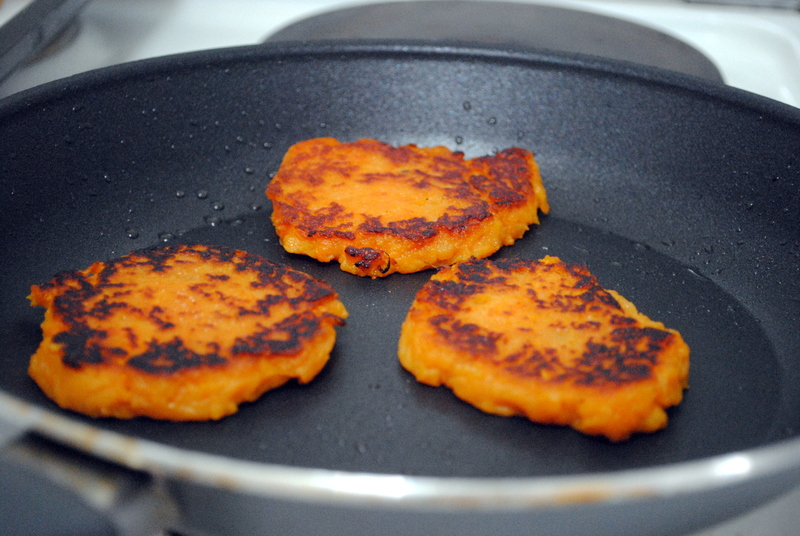 Fry the latkes gently for 4 to 5 minutes, flipping them once. They should be nicely browned and firm enough to be removed with a spatula. Transfer to a paper towel-lined plate. Fry in batches until all the batter is used. Add more oil or butter, if necessary and make sure the oil is hot before adding another batch of pancakes. 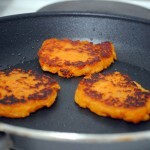 Serve the latkes warm or set aside and reheat in a medium-hot oven (not in a microwave!). 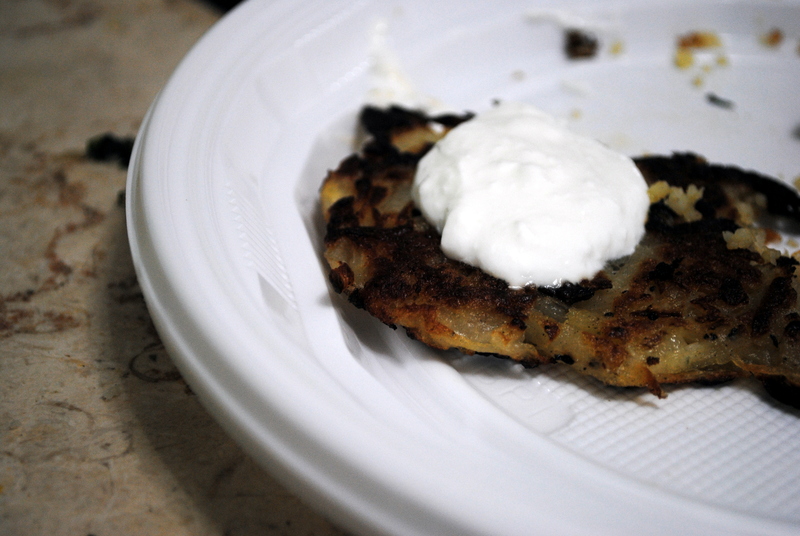 Reheating actually improves the texture, so these latkes are perfect for making ahead. yum. i went to a latke party this weekend and there were original, sweet potato, curry butternut squash, carrot ginger and apple brandy latkes. also an array of dips and relishes, with my favorite being a celery cilantro. yum, yum, yum. Katherine, Thank you for the shout out! I can’t wait to try the other two recipes!!!! !